Put on the AF Fisheye-NIKKOR 16mm f/2.8D and watch nearly every setting or space open up to a stunning new view. Achieve dramatic 180-degree fisheye coverage with edge-to-edge sharpness, even at the lens’ widest f/2.8 aperture setting. From landscapes and action to architecture and interiors, the AF Fisheye-NIKKOR 16mm f/2.8D delivers consistently spectacular images. 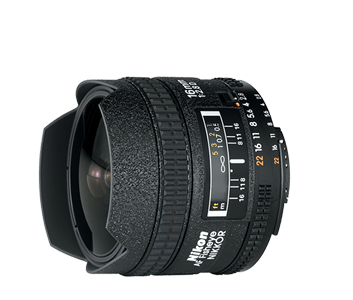 The technology behind the AF Fisheye-NIKKOR 16mm f/2.8D assures that every image will meet and exceed your expectations as a photographer. Close-Range Correction (CRC) system enables closer-than-typical focusing—as close as 0.8-ft from your subject. Nikon&apos;s Super Integrated Coating (SIC) minimizes flare and ghosting while providing rich color balance and contrast. Create stellar images, even in demanding shooting situations.